It can be really overwhelming when you feel like your entire home needs to be decluttered and organized. Where do you start? How can you stay motivated to get through all of the clutter? I'm going to share my secrets on how to ALWAYS have an organized home. No more stressing when friends or family visit unexpectedly. No more scrambling to find your keys in the morning. These steps will help you set goals for your home and establish routines for your family that will keep your house clutter-free and welcoming everyday. Clutter accumulates gradually over a long period of time. So, it only makes sense that decluttering will take quite a bit of time as well. When you look at your house as a whole, it is easy to get overwhelmed and feel like quitting before you even get started. However, when you start small - even if it's just one drawer - you have made the first step in tackling this daunting task. People always ask me, "What area should I start with?" There is no wrong answer to this question, but I suggest starting with an area that you notice everyday. It could be the kitchen counter. Or maybe it's the stack of mail you have been avoiding. Or the junk drawer that you can barely get open. Whatever it is, make sure you have set aside enough time to FINISH that space in one session. You want to avoid making the problem worse by starting, but not finishing, the project. The organizing process is the same, whether you are doing a drawer, a closet, or your entire home. First, EVERYTHING must come out. As you are pulling everything out, you are sorting like things with like things. So for instance, in the photo above, we gathered all of the tools together, all of the pens together, all of the lighters together, etc. Once you have it all sorted, go through each category and take out anything that is trash or can be donated/sold. (I like doing this part separately from the sorting, because once everything is sorted you can really see how much you have of each item.) Knowing that you have multiples of a certain items can help make it easier to purge them. The final step is crucial to STAYING organized! Give each category a "home". Here I used simple white bins from the Dollar Store along with an extra utensil tray that the client already had on hand. You don't need to spend a ton of money on bins or drawer organizers, but if you want to stay organized it is essential to use something to contain each category. You can get really creative with using items you already have around the house. One of my favorite money saving tips is to cut the top off of empty boxes or cartons from items you have purchased. You don't even have to spend a dime on new products. Once you have established a "home" for all of your items, you must maintain the organization. The best way to do this is to create new routines and habits. There are daily routines such as making sure the dishes are put in the dishwasher, dirty clothes are in the hamper, and your bed is made. In short - everything is put back in its "home". The weekly routines include things like cleaning the house, doing the laundry, and filing papers. Staying on top of these chores will keep your home organization very manageable. You can't do it all yourself. There are multiple people making the mess, so it's unrealistic to think you should have to clean it all up by yourself. I love this picture hanging in my client's house. 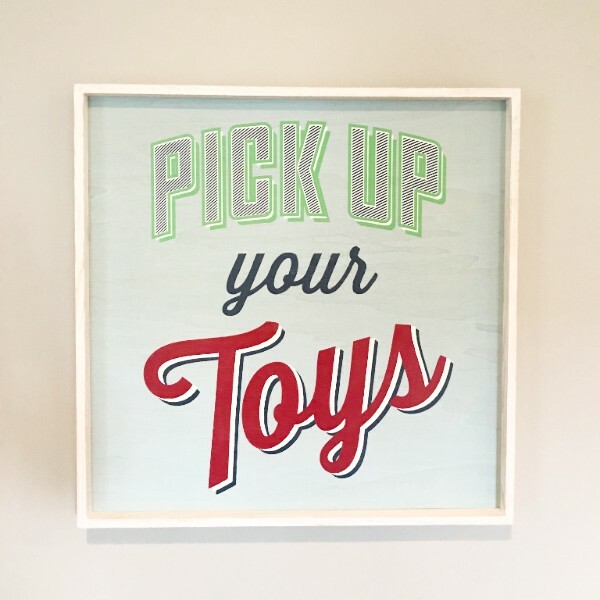 "Pick up your toys". When the responsibilities are shared in a family, a house is more likely to stay organized. Create new habits and routines for your whole family! Adding plants or flowers throughout your home will add life to it - even if you are like me and need to use fake plants, because real ones don't stand a chance under my watch! Rearrange furniture to give a whole new vibe to an old space. Or pick an underused color in the room and add more of it by adding pillows, a throw, a rug, or a table runner. Whatever phase you are at in the organizing process, setting goals for your home will help you stay focused on making your home a place you are proud of, a place you can share with friends and family, and a place you can go to for an escape from daily stresses. If you are stuck in the decluttering and organization phase, we would love to mark that off of your to-do list for you. You can skip straight to maintaining and enjoying your organized home by letting Suddenly Simple do the work for you. Oct 11 The Most Overlooked Area You Need to Organize NOW!